I very much enjoyed The Address by Fiona Davis and was looking forward to this book. She is a masterful storyteller with the ability to completely transport her readers into a different world. The Masterpiece is another wonderful story, but I did not connect to the characters as well as I did in her previous book. Saying that, I still enjoyed this story quite a bit and felt for both Clara and Virginia. The Masterpiece tells the story of two women, who both work at Grand Central Terminal, fifty years apart. Clara is an illustrator, who is teaching at the art school housed at Grand Central. She is not considered an artist, but she has more talent than some of the male teachers and artists. Virginia is a recent divorcee and single mother, who is trying to support herself and her daughter. She is working in the information book at the Terminal. Both of these women are trying to find their way in a world dominated by men. I absolutely loved this storyline, and doing it all within the confines of Grand Central Terminal was very interesting. There was so much going on in the story that I was not familiar with, and the story was so realistic that I felt like I was there. I loved the inclusion of Jackie Onassis trying to save the Landmark status of the terminal. Her descriptions, down to the smallest details, are so realistic. It truly feels like you are reading memories. I love the way she is able to blend the lives of these two women so well adding in art history, romance, intrigue, scandal, and drama. Throw in some amazing secondary characters and it is hard to put this book down. I listened to the audiobook of this story and it was amazing. She did a great job of sharing this story without worrying about voices, she told the story to me. Overall, I loved this story. It is important that you read the Author’s Notes at the back of the book as she gives information about her research, what parts of the book are real and which fiction, and what and who the characters are based on. If you are a fan of of historical fiction and books that are character driven, then you need to pick up The Masterpiece, or any books by Fiona Davis. 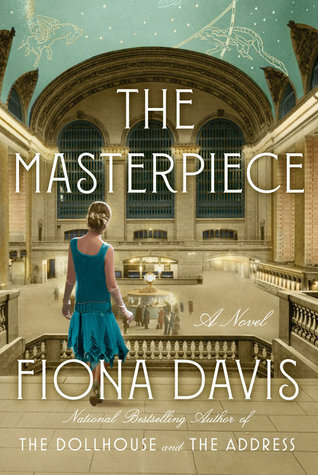 About the Book: In her latest captivating novel, nationally bestselling author Fiona Davis takes readers into the glamorous lost art school within Grand Central Terminal, where two very different women, fifty years apart, strive to make their mark on a world set against them. About the Author: Fiona Davis is the nationally bestselling author of THE MASTERPIECE, THE DOLLHOUSE and THE ADDRESS. She began her career in New York City as an actress, where she worked on Broadway, off-Broadway, and in regional theater. After getting a master’s degree at Columbia Journalism School, she fell in love with writing, leapfrogging from editor to freelance journalist before finally settling down as an author of historical fiction. Visit her at www.fionadavis.net, facebook.com/FionaDavisAuthor/ and on Instagram and Twitter @fionajdavis. About the Narrator: Cassandra Campbell is an actress, director, and teacher as well as an accomplished voice-over artist. Voice credits include numerous books on tape, documentaries and commercials in both Italian and English. As an actress she has performed in New York at the Public Theatre, the Mint Theatre, and the Clurman as well as many others. Regional work includes StageWest, The Berkshire Theatre Festival, Millmountain Theatre, and The Baltimore Shakespeare Festival. She currently lives in Los Angeles where she a faculty member at the Los Angeles County High School for the Arts. 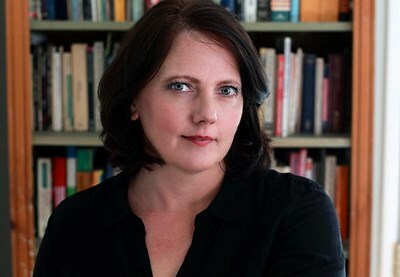 In addition to lending her voice to the fantastic ensemble performances of The Help and Gillian Flynn’s Dark Places, Campbell has narrated over 600 fantastic works of fiction and nonfiction. Besides voice acting, she also directs audiobook productions. What an interesting premise. I’ll have to check it out. Thanks for the recommendation! You are welcome. I hope you enjoy it if you do read it. Great review. This sounds like an interesting read! Thanks, it was a good one. If you enjoy historical fiction, you will enjoy this one. So glad you loved this one! I have it on audio. Fantastic review! I almost got this on audio when I had my audible membership but wasn’t too keen on the sample I heard. Fortunately it’s available as an ebook on my library’s Libby app, so it’s on my wishlist. I listened to it on Overdrive. I hope you enjoy it. I loved The Address, but did not read The Dollhouse. How exciting that she is from your hometown and her mom is your friend. She is a wonderful author! She sure is! And is a sweetheart, too. My librarian friend went to a book convention in New York where Fiona lives, and she sent me a picture of the two of them together at the convention on my phone. This author is an amazing writer. I can’t wait to read her “newest.” I think I will choose to buy the print copy rather than listen to the audiobook. R.
I hope they have it. I am loving hoopla, Axis 360 and Overdrive from the two library systems I have access to. Lots of ways to get an audiobook. Good luck Sandy. I love a good story and this sounds like one. Great review, Carla. I was very happy with this story as well as learning a bit about the time the past story took place, Thanks Linda.